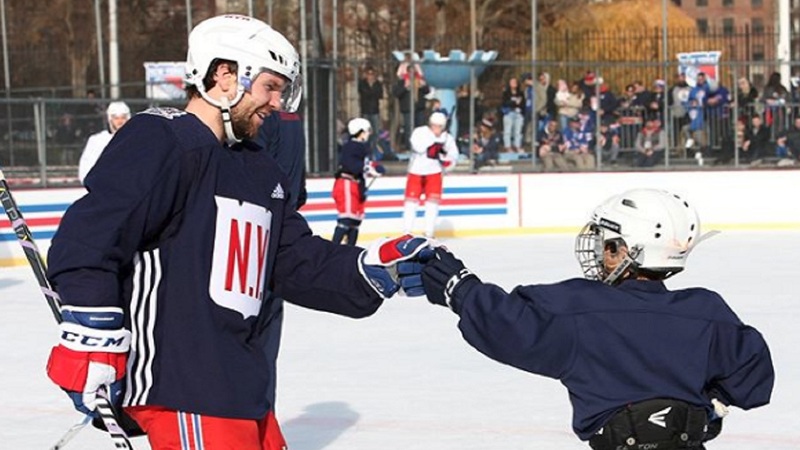 UPPER EAST SIDE, Manhattan (WABC) -- New York Rangers fans got a rare up close look at their favorite team Saturday at Lasker Rink in Central Park. The free event was an opportunity to see the Blueshirts practice in preparation for the Winter Classic, set to take place on New Years Day at Citi Field against the Buffalo Sabres. Hockey is best experienced and played in it's purest form, on outdoor rinks or ponds. Head Coach Alain Vigneault said; "It's a great day, turned out to be unbelievable weather. The ice was good, the guys went out and had a good 45 minute practice, and the fans seemed like they enjoyed it." The head coach added; "I never thought I'd get the opportunity to do this (laughing). For me it was outstanding! Everyone was in a great mood, the win yesterday helps out a lot, but guys went out there and did what they're supposed to do. They worked hard, had fun, had fun with the fans after, and it turns out to be a great event." Vigneault talked about his first experience with the Rangers when they held an event at Yankee Stadium in 2014. "I've had two of those my first year, and they were some of the best events I've had in my life. I'm really looking forward to January 1st, and we've got a step on Buffalo right now, we've already had a practice outside." Upon reflecting on his youth playing hockey outdoors, the head coach said; "You go back to your young days when your putting your skates out in the little house by the rink, you're putting mittens on and your going out there and you're spending hours on the ice, just for the love of the game and the fun of the game." The Rangers are coming off a 5-1 victory on Friday night against the Carolina Hurricanes. Next up for the Blueshirts are the Pittsburgh Penguins who sit in 4th place in the Metropolitan Division. The Rangers are winners in 7 of their last 10 games and currently sit in 5th place, 1 point behind Pittsburgh. Face off is set for 7:30 p.m. Tuesday in Pittsburgh.